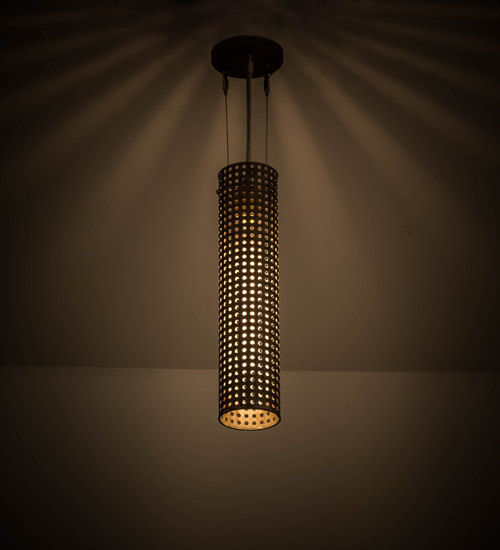 Description: Designed with a cylindrical profile that fits into a broad range of settings, this Cilindro Mini Pendant evokes a striking aesthetic. The stunning diffuser features a matrix design with steel perforations that reveal soft ambient light. The handsome hardware and frame are featured in an Ombre Lavato finish. Install these mini pendants in a row across an island, counter, bar or table for a complete designer look. Handcrafted by skilled artisans in our 180,000 square foot manufacturing facility in Yorkville, New York, this fixture is available in custom colors, styles and sizes, as well as dimmable energy efficient lamping options. UL and cUL listed for damp and dry locations.